Guest post written by Peter Barrios-Lech, Assistant Professor of Classics at University of Massachusetts Boston. Even before the Aeneid’s “publication,” news had gotten out that Vergil was working on something truly grand. Propertius had heard a few verses, which so moved the Umbrian poet that he broke the secret in one of his elegies. Now Augustus wanted to hear the epic: not just scraps, but a proper book, or three. The Mantuan bard obliged – did he have a choice? The VIP audience assembled for a private recitation, and Troy burned before their eyes, the Carthaginian Queen lusted for Aeneas, to her own and Carthage’s doom, and Aeneas descended into the murky depths of Orcus to hear from the shade of his dead father, all of it summoned forth by the poet’s voice – which, as Donatus insists, was uniquely enchanting and seductive. Vergil arrives now at the tail-end of Anchises’ roll call of Roman patriots who’ve queued up along the river Lethe. Vergil makes us see the procession through the eyes of Aeneas, who pauses at the sight of a particularly youthful hero, with downcast face and grim features. The poet from the Po ventriloquizes Aeneas’ startled reaction: “Who’s that?” Anchises’ ghostly reply (as evoked by Vergil) follows: “he’s our great hope – unfortunately cut off from life at the bud.” Now, Anchises – or is it Vergil? – turns to the youthful shade, summoned forth before the spectators: “If you ever do evade what fate has in store for you – tu Marcellus eris.” It’s too much for Octavia, mother of Marcellus. The latter, recently dead at nineteen, would never fully be Marcellus. Octavia passes out. Why didn’t the Mantuan take his audience into account before deciding which material to try on them? (“Ah, there’s Octavia. Right, end of six is out.”) And why does Augustus, in the painting by Ingres, or the one, by Wicar, need to tell the poet to stop reciting? Surely Vergil will have already noticed Octavia was no longer conscious? In any case, let us imagine the following. 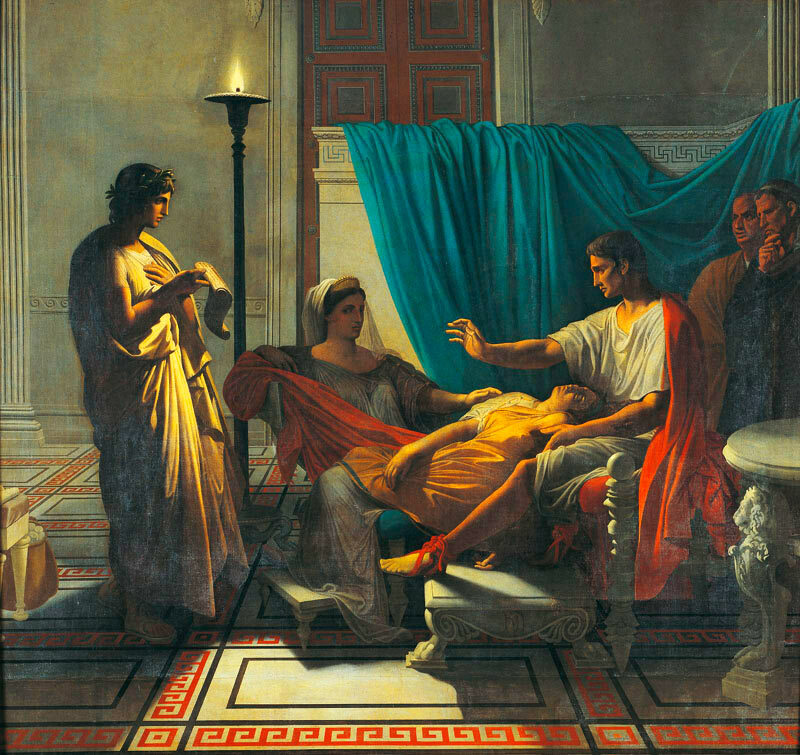 Prior to the scene depicted in our paintings, Vergil saw that Octavia had collapsed. Yet, in his desire to get to the end of his masterpiece, the poet chooses to ignore the unconscious sister of the princeps. (Not so strange. After all, can you imagine Beethoven, conducting his Emperor concerto from the piano forte, suddenly stopping right before the finale, simply because someone in the audience had passed out?) So Vergil just keeps on reading. The emperor holds out his hand in a kind of “stop” gesture, and then says…what? If you are puzzled, you are not alone. Until recently, no one would really have been able to answer this question, posed in this way. Fortunately, Wolfgang de Melo, an Oxford professor, in a book published a decade ago, made some important discoveries – important, that is, for any Latinist who wants access to how native-speakers might have used the language. Let’s imagine you’re in a library and someone is clicking a pen. You want to tell them to stop – nicely, of course. So you might say, “stop clicking your pen – please!” This is a prohibition, what linguists would call an “inhibitive.” Now let’s say an hour has passed, and the same pen-clicker has her thumb poised, ready to start again. You don’t want to hear that annoying noise any more, so you say: “don’t do it…please.” This would be a different kind of prohibition, a preventive, used when you want to stop something before it happens. Back to the Ingres painting. Vergil continues to read, despite…certain events. Augustus tells him to stop. The son of the divinized Caesar wouldn’t have said ne feceris, for this is a “preventive” – used to stop something before it even gets started. He might have used noli facere, but, as I have shown elsewhere, this was polite (at least for the period when Plautus and Terence were active), rather like saying “please don’t.” I can’t imagine that Octavian would have used a polite form to a subordinate (=pretty much everyone). Ne faxis is out: as de Melo showed, this belongs to a high-register: that is, ne faxis is more elevated than any of the other prohibitions shown above, rather like English “forfend” or “refrain from” doing something. That won’t fly for someone who famously cultivated a “man of the people” image. Finally, there is not one token in Plautus and Terence of ne facito, so I doubt this form had any currency in the spoken language. What options is the first emperor of Rome left with? Ne facias and ne fac. Both are neutral: that is, neither conveys a rude command, yet neither is especially polite (contrast noli facere). Neither has the elevated tone that ne faxis has. But the similarities stop there. Ne fac is precisely an inhibitive. With very few exceptions (nicely documented by de Melo), it always means “stop [doing something]” So, ne querere: “stop complaining”; ne calamo isto strepitum fac: “stop making noise with that damn pen of yours”; and ne recita ultra: “stop the recitation.” “So there’s our answer,” you might be thinking! Well, there’s a slight problem. Ne fac was already felt to be “old-fashioned” in the period when Cicero was active. And precisely because it had a recherché ring to it, Latin poets liked to use it. So I say Octavian didn’t use this form, either. For, although the future Augustus was many things, a Latin poet he was not. Indeed, Octavian was reported to have said that his tragedy, the Ajax, quite justly had fallen on the…eraser. Octavia faints on hearing tu Marcellus eris. Vergil, nothing detained, continues reciting. Indeed, ne facias can be either inhibitive (that is, it tells someone to stop doing something) or preventive. In Terence, at least, all examples are put in the mouth of low-status characters, with one exception (we’ll get to it, soon). That distribution argues for the “colloquial” status of ne facias: in other words, it was doubtless a feature of the spoken (Latin) language. In the exceptional instance when a high-status speaker uses ne facias, he addresses a low-status character. This might be an example of accommodation, that is, bringing your language in line what that used by the addressee. So, your (Latin-speaking) three-year old is banging a spoon against a saucepan? Ne strepitum istum fac! Or, better, ne strepitum facias! Or, nice, too, if a bit wordier: mitte facere istum strepitum! Someone you don’t know in the library clicking their pen, and want to tell them not to do so – politely? Noli istum strepitum facere, or, perhaps better, noli, quaeso, istum strepitum facere. What if you’ve just paid for a friend’s drink, and the latter is poised to hand over a five-dollar bill in recompense? Ne feceris – nam inter amicos non necesse est. (noli facere would also do, for the form can either be inhibitive or preventive). 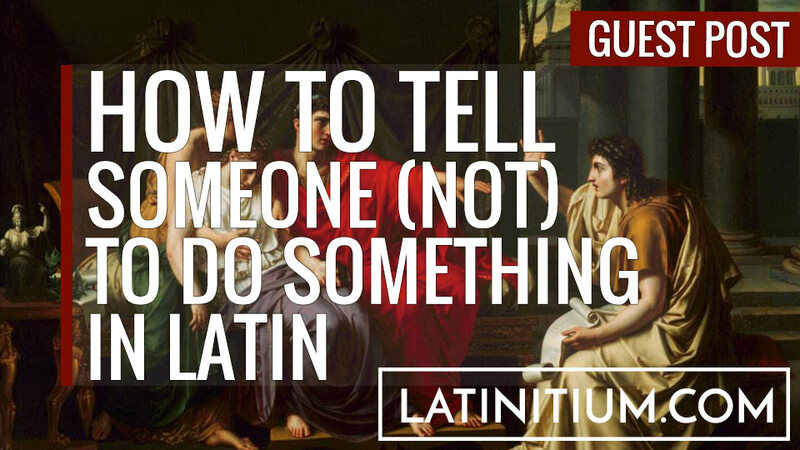 If you haven't read Professor Barrios-Lech's article on how to be polite in Latin, you can find it here.